The usual path to living a greener life begins with food. Switching to organically grown and locally sourced food lessens one’s carbon footprint, as well as protects one’s family from harmful pesticides, herbicides, food additives, and food chemicals that can harm human and environmental health. It is a switch that is easily undertaken, as organic food is now available in almost every grocery store. After the kitchen and the bathroom, what comes next? After getting rid of chemical herbicides, pesticides, and fertilizers for the yard and garden, many people forget about the other products in the garage. They simply don’t know green alternatives exist. How can you replace those trusted old products like WD-4o? Most coops and health food stores do not have space for natural hardware type items. Most hardware stores don’t realize there is a demand or even alternative products out there. Our garages and shops are often full of toxic products we use in our homes, around our children and pets, as well as our food. We recently discovered non-toxic “high purity lubricant & protectant” we are very excited about! Bye bye WD-40! We don’t need you for our squeaky hinges, stubborn zippers, and corroded keyholes anymore! Glide Lube delivers the same results you expect without VOCs, flammability, and it’s safe to be used on appliances and around food. This stuff is amazing! Glidelube is a completely green mutli-purpose lubricant and protectant with thousands of uses and a unique benefit of providing safety for people and the environment. It’s a WD-40 on steroids without the harmful ingredients! It simply outlasts and outperforms any lubricant on the market. It’s tough enough to use on airplane engines and gentle enough to use around the house. Unlike our competitors (WD-40), its 100% nontoxic, odorless, colorless and contains no Volitile Organic Compounds. The best statistic is that Glide has a H1 NSF rating so it can be used I food processing with incidental contact with food. • Erases crayon from walls, toys, flooring, furniture, windows, etc. • Lubricates tracks in sticking home windows and makes them easier to open. The list of uses is endless! 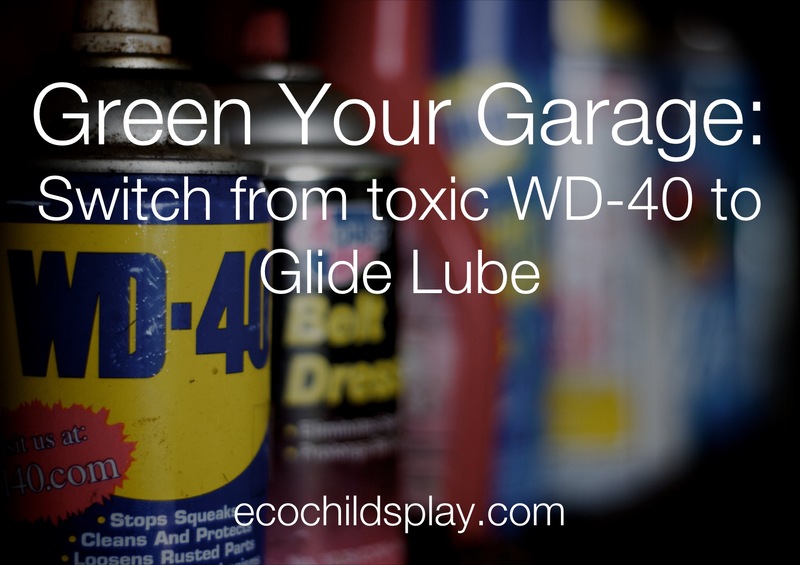 Why should you switch from toxic WD-40 to safer Glide lubricant? Ironically, WD-40’s headquarters are in California. It makes me angry when companies make a safer product only where laws dictate it, yet fail to make the safer product available to the broader public. It reminds me of General Mills making GMO-free Cheerios only for the European Union. Glide Lube has absolutely zero VOC content! If you read the warning label on WD-40, you will see the words “extremely flammable”. 4)http://www.wd40company.com/files/pdf/sds/mup/wd-40-multi-use-product-aerosol-sds-us-ghs-7-20-14.pdf Glide Lube’s flashpoint is more than 240 degrees F and is considered “non-flammable”. Thus, it is safe to use on squeaky oven hinges, woodstove doors, etc. We’ve got to imagine whoever handles the social media at WD-40 hasn’t read the product’s own label recently, because if so, that person would know that WD-40 is toxic and harmful to humans when ingested, making it a bad idea to use the stuff on anything that dispenses food or beverages. But heck, it’s World Bartender Day and no one wants squeaky tap handles, right? The thing is, according to WD-40’s own site, the product is “harmful or fatal if swallowed” [PDF]. And on the can’s label? A giant skull and crossbones, indicating a toxic substance. I suggest you gift your favorite bartender Glide Lube instead. The product is registered NSF food grade. Go ahead…use it in the kitchen! Beer taps aren’t the only instance in which WD-40 use recommendations were inappropriate. It is shocking to me that Crayola would recommend using WD-40 to remove crayon marks.6)http://wd40.com/cool-stuff/myths-legends-fun-facts Where there are crayons, there are children. Fortunately, Glide Lube will remove crayons from walls. This afternoon when I came home from walking the dogs, my son was outside using Glide on his bicycle and the garden cart. I felt a sense of relief knowing this product was safe for him to use, as well as a sense of pride he was taking care of his bicycle and cart. I hope in the near future, we will see more household and garage items become available that are green and eco-friendly. I am thankful I discovered Glide Lube! It works really well! The zipper on my favorite pair of boots works effortlessly now! 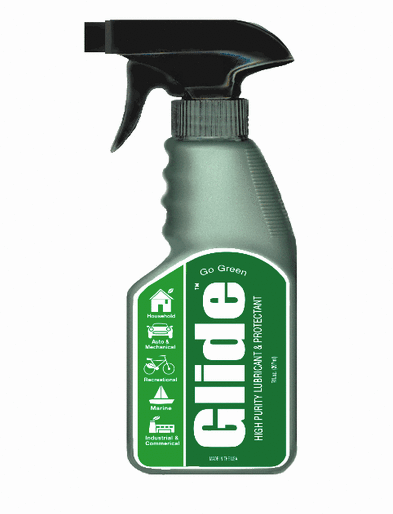 Glide Lube is a great place to begin making your garage or shop shelves safer. Glide is offering our readers a discount if you would like to try this safe, effective product. Please visit www.GlideLube.com and enter the coupon code is EcoGreen25 for 25% off!